My dad suggested we make crab apple jelly. Wyatt and I thought it was a fantastic idea. In my imagination, making crab apple jelly involves foraging adorably small sour apples in weather that's just starting to turn cooler. The crab apples don't take too much preparation before cooking because we will strain out seeds and stems later. Once the apples are on the stove, a cranberry-meets-apple fragrance will fill our home as the pot bubbles away. 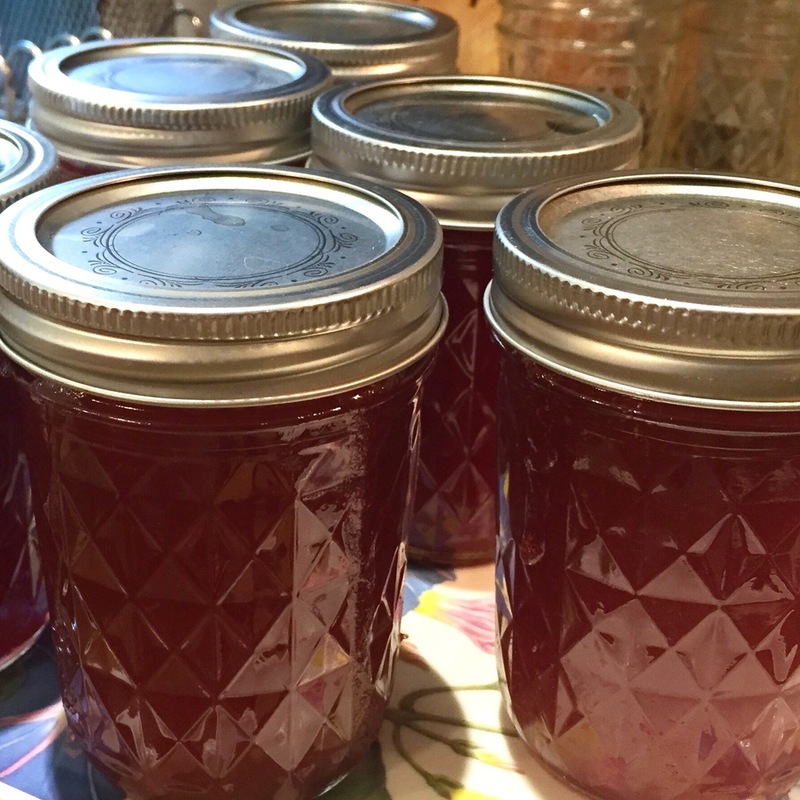 And once the jelly is in the jar, we will see its beautiful, clear red color, and I will probably declare that crab apple jelly is my new favorite thing. It will be tart, sweet and delicious. I have a terrific imagination. And the only thing I got right in that Pinterest-tinged daydream was that the apples smelled wonderful while we cooked them. Attempting the jelly actually involved my dad and Wyatt picking cherry-sized sour apples from a tree in the yard in 80 degree heat and swamp-like humidity. A ladder was required. The apples also took a fair amount of preparation. My parents, Wyatt, and I started chopping the apples in half to remove their long stems. The apples were hard, though, so Wyatt couldn't cut them with his kid knife. As a result, he was left on stem removal duty. Because removing stems is way more boring than cutting apples, he pretty quickly wandered off to go play with the dog. My parents and I finished preparing the crab apples, and my dad consulted the general jelly recipe directions in The Joy Of Cooking. We cooked the cut crab apples as the book recommends, with just enough water so that they were definitely all in water, but none of them were floating. About 15 minutes into the cooking process, we realized that we were making crab apple sauce instead of jelly. We did not have enough water in the pot, and we guessed that the chance of straining the sauce and getting any clear juice was almost none. Nevertheless, we tried to strain it in cheese cloth. We made a mess, and we strained no juice. Disappointment! But then we thought, maybe we should just make jam. I found no crab apple jam recipes online. Undaunted, I suggested we try a honey lemon apple jam recipe. We followed the spirit of the recipe. We added honey, sugar, more honey, more sugar, some lemon juice, even more sugar, and we thought it tasted great. We sealed it in the prepared jars. The jam didn't set. We waited 24 more hours. It still didn't set. We were indignant. We wondered aloud, "Why didn't this work?" all the while knowing that any success in this project was thanks to sheer luck. 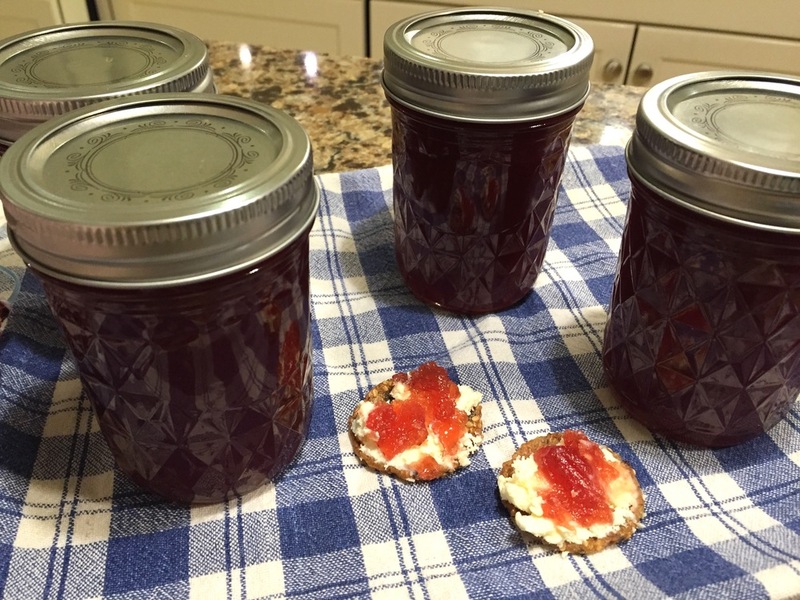 After all, we sort of followed some recipes, substituted the main ingredient, didn't check the temperature with a thermometer, and we didn't test to see if the jam was ready to set before we put it in jars. We decided to make the runny jam set (dammit.) We went to the store, bought some Certo, and attempted to merge the directions in the Certo with the directions from my favorite canning blog, Food In Jars, to ensure that the stuff set. We reheated the sauce-jam, added more sugar, used the thermometer, added Certo and lemon juice, and poured the jam into jars again. And it set! Boy did that jam set. It set immediately, and in all honesty, it is probably way too firm even to be called jam. It seems we overcorrected. On the bright side, though, the crab apple concoction tastes great with cream cheese, and it stays exactly where you place it.